Ok, why do we have a story about a cat posted here on Barkswell? Bear with me. I’ll bring this around to dogs, trust me. Some time ago my husband and I decided to go take a look at the local shelter. We weren’t particularly looking for a new pet, we just needed to be around animals for a bit. You know, show them a little love while they wait for their forever homes. What we found was a little cat named Callie. She was an older cat and not at all what we would even consider as a pet. Babies are just too cute! But I stayed by that little old lady’s cage and talked to her. Finally it came time to leave. We did not take Callie home with us. All night I thought about that cat. In the morning I called my husband (he’d gone to work very early) and I told him I wanted that cat. He told me he was glad because he hadn’t been able to stop thinking about her either. So we went and got her. And here’s where the fun part starts. She was terrified! Really, it was horrible. We both felt terrible and didn’t know what to do. She would hide under the bed. She would hide there all day and all night. She wouldn’t come out. When we were both gone she would slip out and use the litter box but that was about it. We had to feed her under the bed. Then one night I had an idea. If she wouldn’t come up on the bed with us, I’d go down to her level. I spent that night down on the floor next to the bed. I didn’t talk to her or try to reach for her. I just slept there beside the bed. This went on for a while. Eventually she began sleeping closer to me. Still under the bed, but closer. And finally, the big day arrived. She came out. And she became a very important part of my life. She was eleven years old when we adopted her but she stayed with us for another nine years. She became my best friend during that period and she still remains in my heart. And yes, I miss her terribly. But you are still wondering what in the world this has to do with dogs, right? Well, a year or so later a friend of mine adopted a dog. Just like my Calli, this was an older dog, a dog who had known a family and was now living in a strange environment with people he didn’t know. And just like Callie, he his under the bed. My friend was at a loss, about ready to take the dog back to the shelter. But then I told her what I had done with Callie. My friend tried it and it worked! And a year or so after that she gave the tip to another person who I didn’t know who was having the same problem with another adopted dog. And it worked for that dog too. So, this really is a dog story. It just starts out with a cat. If you have a dog who hides under the bed, try sleeping down beside the bed. Don’t be too aggressive. And by aggressive I’m not accusing you of attacking the dog. I just mean you should try to see things from the dog’s point of view. It’s one thing to lay down beside the bed he’s hiding under, quite something else to reach in there after him. He’ll see that as you encroaching on his safe spot. Don’t talk to the dog at first either. He doesn’t know you yet and doesn’t want to hear from you. He hasn’t decided if he likes you yet. In fact, he probably doesn’t like you at all. That’s why he’s hiding! Don’t take it personally. He’s just scared. So just lie down next to the bed and go to sleep. He’ll come around. During the day, go about your business. But talk a lot. Talk to yourself if no one else is around. Get him used to your voice. After a few days, if he hasn’t come out yet, talk to him when you lay down at night. Toss a treat under the bed. This will work! I promise. Don’t give up. 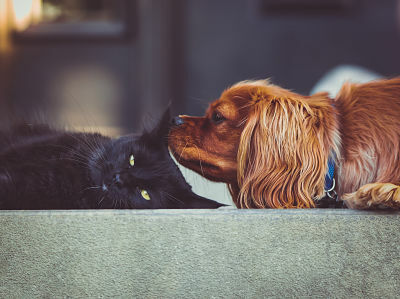 Some dogs (and cats) just talk a little longer to acclimate to new environments. But the worst thing you can do is give up and take the dog back to the shelter. That will only make it that much more difficult for the next person who comes along. Give the dog a break. You’ve already decided to let him into your heart. Now give him a chance to let you into his heart too. Dogs are fiercely loyal. The dog you’ve adopted may have come from a family he cared for deeply. Who knows why they gave him up? But now he feels betrayed and lost. If you give him time to get to know you, he’ll shift his loyalty to you. Is sleeping on the floor too much to ask? You can do it. Trust me, I do not like sleeping on the floor. But it was worth it for me. I got a great friend out of it. It worked for me, it worked for my friend and her friend, it will work for you too. If you enjoyed this post, you should read “NAME OF POST” here(LINK).